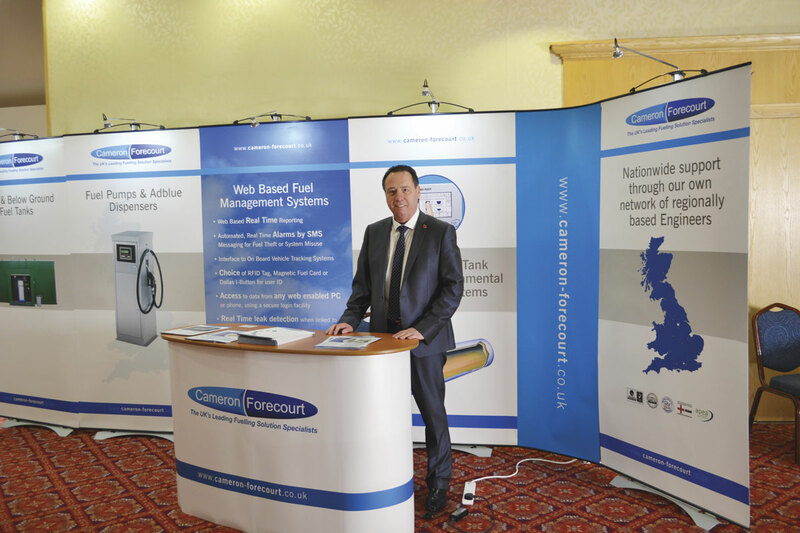 The Forecourt and Fuel Solutions Roadshows are a series of established regional exhibitions held in five destinations across the country. Organised by Thames Communications based in Gravesend, Kent, the events have been running for a number of years. B&CB attended the show at the Cedar Court Hotel in Wakefield to find out more about some of the latest products and services in the commercial vehicle marketplace. In addition to the 35 exhibitors, there were presentations from members of the Petrol Retailer’s Association. There was a steady flow of visitors throughout the day and although some of the stands were more directed at the forecourt market, many of the exhibitors served the bus and coach sector, providing such services as fuel storage tanks, cleaning and maintenance, fuel management systems and dispensing equipment. Liverpool based Ancorra Environmental Services are a relatively new business, having set up their operation just two years ago. Experience isn’t something that they are lacking in however, as the team boasts 100 years of service in the field and they have clients such as Arriva and Stagecoach on their books. Their range of services is available nationwide and include: servicing and cleaning of interceptors, tank cleaning, pipework installation and pressure washing. Where applicable, they use grey water and have a number of BSI (British Standards Institute) awards in the areas of quality, health & safety and environmental. Founded in 1988 Profile Lighting have established themselves as leading suppliers of standard and specialist lighting equipment. Their main focus was a new LED petrol canopy light but they have a number of solutions suitable for offices, such as spots and down lighters as well as LED options for garages and workshops where changing of bulbs, due to ceiling heights isn’t a straightforward job. The LED strip lights, which would be a direct replacement for the fluorescent tube, are maintenance free and guaranteed for five years or 50,000 hours. The durable, sealed units are waterproof and available in various lengths and wattages. Established over 80 years ago, Cameron Forecourt are well respected fuel solution specialists with a client base that includes Royal Mail, Group 4, Stagecoach, First Group and Arriva bus and rail. They offer a wide variety of services including; above and below ground fuel tanks, fuel pumps and AdBlue dispensers, Veeder Root’s TLS2 tank monitoring system and the Jigsaw Eclipse real time fuel management system. They offer a nationwide support network through a team of over 20 regional service engineers and have offices in both Barnsley and Aldershot. An internationally recognised name in fuel dispenser technology and integrated fuelling solutions, Gilbarco Veeder Root are highly regarded for their products. They offer a range of dispensing units and Adblue pumps for commercial applications. The Gasboy range of pumps offer assisted or non-assisted dispensing with an integrated cardlock system, allowing complete control and management of fuelling. Another core product relevant to this industry is the Automatic Tank Gauge (ATG) range. This provides a series of alarms which are activated by high and low levels, overfill and water ingress. The units can be linked to a web based fuel management system with alerts sent via both email and SMS. On below ground tanks, a leak detection system is an additional feature. Part of OTS (Oil Tank Supplies) the Gloucestershire based company have been providing fuel solutions for 46 years and introduced the TankCare range five years ago. As the names suggest, OTS specialises in fuel storage whilst TankCare offer fuel quality and tank hygiene services. They claim a minimum of 5% reduction in fuel costs along with increased engine output, longer vehicle life and reductions in carbon emissions from using their products. Other services available include: fuel dispensing pumps, electronic tank gauging and fuel filtration systems. Although Karcher’s presentation was focused on their forecourt offering, it is worth noting that they have a large range of cleaning products aimed at the commercial vehicle market some of which we have covered in previous issues. Their specialist bus range includes mobile or stationary, gantry style vehicle washing systems that offer a fast, effective clean, minimising bus downtime. In addition to vehicles they also have tank cleaning systems and their advanced range of cleaning agents. This American based company has a UK base in Ipswich and offers a complete range of fuelling systems including dispensing equipment, pipework and fuel management systems. They are also the manufacturers of Cookson and Zinn storage tanks which provide both overground and underground facilities and the FuelBank range of their bunded storage and dispensing units were promoted at the event. They can supply a secure fuel pump cabinet to reduce theft that can be built to customer specifications. Optional extras include an overfill alarm or prevention valve and level gauges. Also on display were details of Franklin’s Colibri fuel management system which can monitor up to six tanks at once, as well as their probes and sensors and their AnyWare remote monitoring system. With one of the largest networks in the UK and over 2,000 sites where their fuel card is accepted, Keyfuels boast over 300,000 customers and the largest multi-branded network for commercial vehicles, which includes a combination of motorway sites, supermarkets and oil company brands. Included in their glove box sized site directory are a number of road maps of the UK, including a separate map of the motorway network and selected city maps. Entries are also colour coded and carry a bus symbol to highlight which would be most suitable to coaches and LCVs where facilities such as a shop and light refreshments may be featured. An App is also available which will locate the 20 nearest sites to your location. Similarly to Karcher, Washtec were promoting their forecourt car washing systems. They also have a range of commercial vehicle washing products and claim to be the world’s largest manufacturer of these. Their brand, the MaxiWash is available as the Generation, Vario and Express options and offers the latest technology for efficient cleaning. Cardiff based MDM services have been providing Wales and the south west with fuel pumps and equipment since 2001. They offer a full range of services from installation through to maintenance contracts and their products include Veeder Root tank gauges, fuel management systems and reconditioned tanks and pumps that come washed and tested and with a warranty if required. Centaur Fuel Management was stand sharing with MCS Card Systems as they are the main UK distributor of MCS’ Sapphire Fuel Management System, which was the main focus of their exhibit. This is relatively new to the UK market having been introduced just 18 months ago and was developed by integrating existing FMS systems. There are already 200 of the new units in the UK and it is prevalent in truck stops across Europe, with over 15,000 in operation Europe wide, so purchasers can be reassured that the technology is tried and tested. 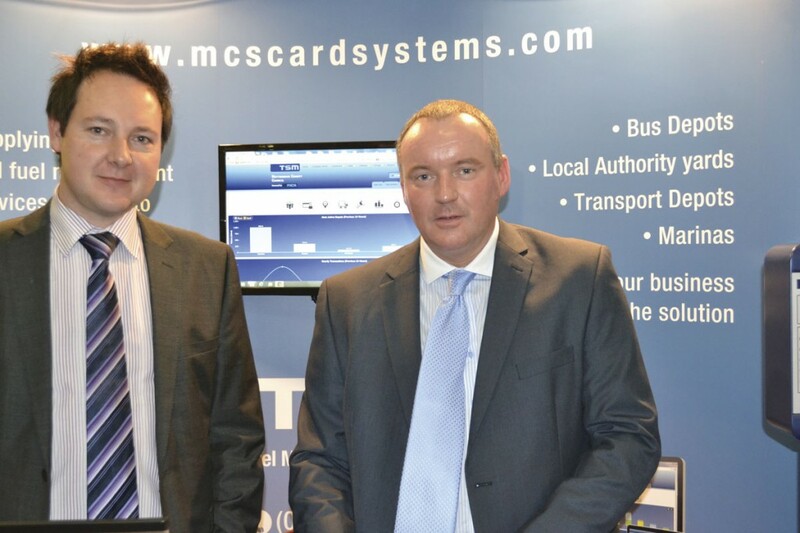 Sapphire was designed to assist in the bus and coach industry and is operated by a card system, keys, fobs or by using contactless or wireless technology. It accepts all major fuel cards and can be either linked to a driver or a vehicle, depending on the requirements of the customer. The system uses real time technology which is activated the instant that somebody fuels up. The mileage of the vehicle is entered so that any inappropriate fuelling of private vehicles is immediately highlighted as a discrepancy on the system. 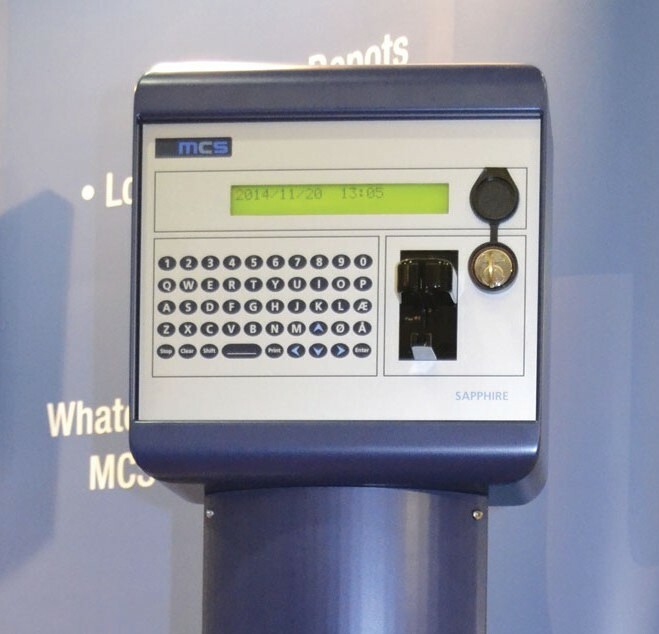 It acts as a stock control system and driver performance tool as MPG can also be captured. The levels can be pre-determined to fit company guidelines and once outside of these, an email is sent via a back office system to named users. Reporting systems can measure vehicle to vehicle performance as well as comparing drivers, so any trends in bad driving can be tracked and addressed. Major retailer Next, claims to have saved 350,000 litres of fuel in six months after changing to this system. Emission rates can also be set on CO2 levels so operators can monitor the carbon footprint of their fleet and determine which vehicle is the greenest – something that could be critical in low emission zones. Control levels for the back office system can be tailored to suit the business. Larger companies may use a tiered system to determine who can access what reports whereas a smaller operator may only allow access to the Fleet Manager and owner. All data is sent via a secure website system (TSM – Total Site Manager) and broadband, wireless or 3G connections are available. There is also an app that runs alongside the back office system and smart phones can be set up to allow instant alerts, allowing for tighter controls. Reports can be pre-set depending on the frequency required by the operator, from hourly, weekly, monthly or annually. One system covers all sites and Simon Jepson of MCS showed me a live system that belonged to a major road haulier and demonstrated how the information could be viewed by depot or as a whole operation. Each site will have its own box which will feed in to the main system and can have unlimited users. There is a small monthly subscription charge for the system.